With the green revolution of 1970's decade, India became self sufficient in food grain production for the first time after independence. The share of contribution to this bumper harvest, of many farmers from states like Punjab, Harayana, Rajasthan and regions surrounding national capital New Delhi, happens to be much larger than that of the farmers from other areas. The reasons for this differential farm outputs, when farmers sow the same hybrid seeds everywhere, are not difficult to ascertain. The main reasons for superior crop outputs from these areas are essentially related to the land, used for cultivation. This land, known geographically as Indus river plateau, is endowed with giant rivers that carry plenty of water in all seasons. These rivers continuously keep augmenting the underground or sub soil water reservoirs. 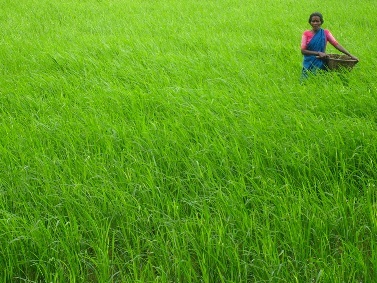 With availability of abundance of ground water, the farmers here are able to grow crops like wheat, rice and barley round the year. An American agency, National Aeronautics and space administration or NASA has some time back carried out a study of the resources of water available on earth with the help of a pair of twin satellites known as GRACE. According to the findings of this study, sub soil water resources in the Indus river plateau have depleted by as much as as 109 cubic Kilometers during period of 2002 to 2008. Since it is impossible to estimate the total quantity of sub soil water that is there, it is difficult to predict as to when these sub soil water resources would dry up completely. The observations from satellites however show that the water table is going down in this area by a foot every year. A study carried out by world bank says that the farmers from this area are pumping out about 63 Cubic Kilometers volume of water each year. Out of this, only about 45 cubic Kilometers of volume of water can be replenished by the rivers flowing in this area. According to another study done by world bank, around 60% of agriculture and 80% of non urban areas in India source their requirements of water from ground water resources. The total use of sub soil water in India is approximately 230 cubic Kilometers, which works out as 25% of the volume used by entire world. From the total number of Indian sub soil resources, around 29% resources have reached semi critical or critical stages. It is estimated that by 2025 about 60% of groundwater resources would reach critical stage. 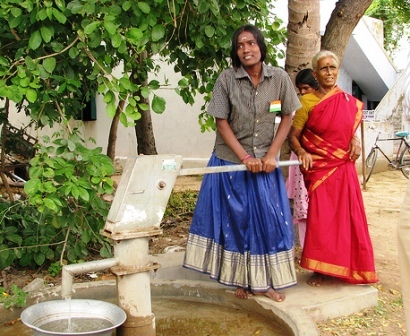 In the states of Gujarat, Harayana, Maharashtra, Punjab, Rajasthan and Tamil Nadu at least 54% of the ground water resources are already critical. India's Central Ground Water Authority has already declared about 1615 resources of ground water out of total 5725 resources, as critical and in case of 108 resources, pumping has been banned. 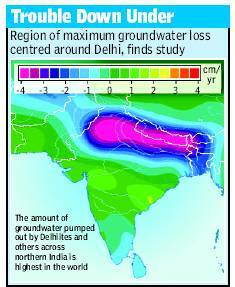 Depleting stocks of ground water is not the only problem faced by the country. The quality of ground water also appears to be deteriorating rapidly. From about 600 districts in India, the ground water resources in about 254 districts are found to contain Ferrous salts above danger levels. In 224 district, groundwater has fluorides above danger mark. 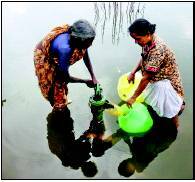 In 162 districts salinity of water has increased making it non potable. In 34 districts, arsenic percentages are now much higher. In some of the states, the situation is even worst. In Gujarat, out of 26 districts as many as 21 districts have ground water with high salinity and 18 have excess fluorides. In the state of Karnataka, 21 districts out of 31 have ground water pollution with excess presence of Ferrous salts and 20 districts with excess of fluorides. In Rajasthan, as many as 27 districts face problem of high salinity in ground water and 30 districts have high fluorides. Even in the national capital region of New Delhi, 5 out of 9 districts have ground water containing high salinity, fluorides and Ferrous pollutants. If we consider the entire country about 33% of available water is now non potable. Such polluted water, not only is a health hazard, but if consumed, is also dangerous if supplied to crops. It has been observed that crops grown on such polluted water, also contain all these dangerous pollutants. The authorities need to take two fold action. Firstly all such polluted water must be treated to remove the pollutants before used and secondly the the quantity that is pumped out from ground also needs to be regulated. Recent development of Reverse Osmosis water purifiers has been an extremely lucky break for India as it I now possible to purify water at a very low cost. However, If above steps are not taken up immediately, India is likely to face extremely serious situation after next 15 to 20 years. There seems to be no doubt about it.